Have you ever eaten something during work that bothers you the rest of the day? Oral healthcare is something that should be maintained around the clock, but it’s hard when you work most of the day, right? 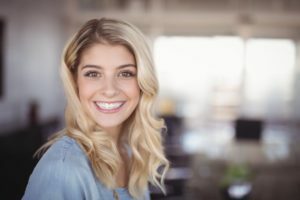 Your dentist in Columbia has some tips on how to take care of your teeth even while you’re at the office. Keep reading to learn the secret to keeping your pearly whites beautiful while pursuing your career! Put some spare oral healthcare products in your desk drawer or your daily bag. Travel-sized floss and toothpaste are good options while at work because they are discreet and can fit in your pocket if you’re on the go. Brush your teeth after meals during your work day, or every 4 to 6 hours. There is such a thing as overbrushing, so don’t brush too often. But, brushing after your meals can decrease the chance of cavities and tooth decay. Dental floss at work can be a lifesaver. Have you ever gone out to lunch and came back to a meeting with food stuck in your teeth? Keep floss or pre-strung floss picks nearby to handle any junk that can get stuck in your smile. Consciously drinking water throughout the day will help prevent stains on your teeth, plaque buildup, and cavities from forming. Water is not only good for your overall health, but it naturally washes away bacteria and food debris. Saliva is a natural cleaner for the mouth and drinking water stimulates saliva. Another way to achieve this same effect is to chew sugar-free gum. If you like chewing gum, try a sugar-free version to keep your teeth healthy and to stimulate saliva production. Whether it’s your mid-day fast food fix or the nearby office vending machines, junk food can affect your oral health. The main ingredients in most unhealthy snacks are sugar and salt. Both can damage your teeth and cause canker sores. If your teeth face prolonged exposure to sugar, the bacteria can turn into acid that eats away at your teeth. So, if you must indulge in an unhealthy snack during work, make sure you have your office dental supplies to clean your teeth! Are you ready for your work day? Use the above tips to stay on top of your oral health during work and to make sure you’re looking and feeling your best for that big upcoming meeting. Dr. Philip Batson is a native Columbian who attended the University of Missouri-Columbia, so he feels deeply connected to helping his hometown patients. He is carrying on the tradition of helping patients in central Missouri, which was started 40 years ago by his dad. He currently practices at Healthy Smiles of Columbia where he can be contacted through his website or by phone at (573) 875-7071 for any questions.